You can buy direct right here at the best price guaranteed. Get that Peace of Mind today! PressurePro is the leading manufacturer of aftermarket Tire Pressure Monitoring products worldwide.Our system isaffordable,does notrequire professional installation, and works exactly as advertised. With tire failures leading the cause of roadside emergencies, we can provide that "Peace of Mind" feeling and greatly reduce the chance of being stranded from a tire failure.You can monitor your tire pressure right from the drivers seat!Pressure range is 10-199 PSI. Also displays pressure in kPa and BAR if desired. Our PresssurePro systems now include High Pressure Alert. User adjustable starting at 24% over baseline. 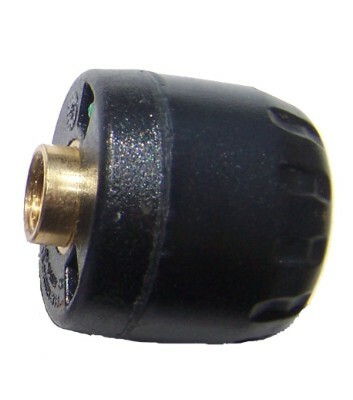 How it works: Small sealed sensors (weighing only 2/3 ounce) are screwed and locked onto the valve stem and transmit an FM signal (433.92 MHz) to the monitor. The monitor checks your tire pressure every 7 seconds or 12,343 times per day! Should a loss of pressure occur (12.5% from baseline pressure at installation), an audible and visual first stage alert will signal a loss of pressure and the affected tire location will flash on the monitor. A second stage alert also occurs at 25%. Valve stems: PressurePro works equally well with rubber or metal stems. Most stems have a rubber seat that are subject to the same deterioration as tires and should be changed at the same interval. We recommend metal stems at your next tire replacement. 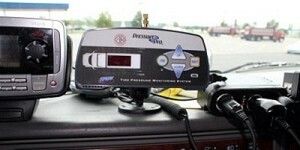 PressurePro does not need wheel movement to read tire pressure. <?xml:namespace prefix = o ns = "urn:schemas-microsoft-com:office:office" />A note about tire blowouts: While no pressure monitor can predict road hazards, according to the National Highway Traffic Safety Administration (NHTSA) and tire manufacturers 85 percent of all tire air pressure losses are the result of slow leaks that occur over a period of hours, days, or months. Only 15 percent are rapid air losses caused by contact with a road hazard, e.g., when a large nail that does not end up stuck in the tire punctures a tire. The result of a slow leak is excessive heat build-up, which ultimately causes the "Blowout." With our PressurePro system, you will be alerted with a low-pressure warning signal long before this heat has a chance to build. Please visit the pages to the left for detailed product description, testimonials, specifications and more. We even have an interactive installation manual loaded with tips to maximize the performance of your system. Helpful winter hint: If you installed your system during the hot summer months and get a false alarm in the winter, this is because the pressure has dropped past the 12.5 percent alarm threshold due to temperature. Simply unscrew the sensor for 1 minute and then reinstall it.The monitor will accept the new baseline pressure. This also might be a good time to inflate your tires to recommend pressure as well. Cold tire pressure is only defined as morning" temperature or before the vehicle has been driven.Tire manufacture inflation tables do not compensate for temperature change. Please watch this short video.Initial reaction to a tire blowout is critical...but very manageable. Keep in mind; this video applies to ALL vehicles with four or more wheels.